Ladies of the Grove: Sepia Saturday #175 What's A Prisoner to Do?? We're two sisters who are craft book publishers and found ourselves in the midst of an avocado grove. We bought this house where we planned to conduct our publishing business and in the deal got 4 acres of avocado trees thrown in. Now we're not only publishers but ranchers as well! This blog is all about avocados and anything else that strikes my fancy. Sepia Saturday #175 What's A Prisoner to Do?? I'll bet almost every prisoner smokes. But after they finish that last pack, what do they do with their trash? Here's what they do, or at least some of the prisoners do. They make lovely pieces of art. You can call it prison art or tramp art but whatever you call it, you've got to agree that it's pretty darn creative. This is a piece that I bought at a Thrift Shop for 50 cents. Can you believe that? Look at the amount of work and hours that went into this cigarette pack heart. I've always loved this and so continued to look for more prison art. I now have a small collection. I'm not sure what pack this is made of. I'm not a smoker so I don't recognize the brand. Here's a closeup in case any of you want to take a guess. My next purchase was a little purse. I got this at a swap meet and I think I paid quite a bit more, maybe $10.00. I love the design of this purse. Especially the way it closes around that square tile and also the addition of the beads. This makes me wonder if it was actually made in prison. I'm not sure if the beads would be available in the prison store. I often wondered if some prisoner made this purse and then gave it to his girlfriend. There's a very informative article about all different types of prison art that may be of interest. 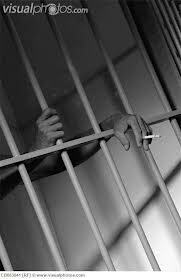 I understand that they're trying to ban smoking in British prisons. Is this true? Then what will those inmates do to while away their time. I guess they'll have to start hoarding their soap! For other stories about vending machines, cigarettes or the dangers of smoking, click here Sepia Saturday. Into my head popped Burl Ives ....buzzing of the bees & the Cigarette Trees! Ha. I'll have to look that up on youtube. Oh yes, Tony ... Big Rock Candy Mountain! Wow, how very creative. It just goes to show with a little time and thought, you can make wonderful things. The soap chair is fascinating and as a child we carved Ivory soap bars in sixth grade. Nothing ever that precise, but my father's uncle used to make delicate chairs like that out of tin soup or vegetable cans. Very impressive! I'd love to see the little chairs made from soup cans. My father often received "Park Drive" (the UK working man's cigarette in the 50s and 60s) calendars and similar art made from flattened packets at Christmas. What a shame that these were not retained. Wow - I wonder if there is a special category for POW Prison Art. I imagine it would be a lot different from regular prison art because of the available items that could whipped into some type of art. Was the ship made from metal - meat ration tins? Imagine using hair for the rigging. Very ingenious. The art is amazingly creative. I can't believe how attractive the purse is and how much use it got, judging from the wear on the clasp! 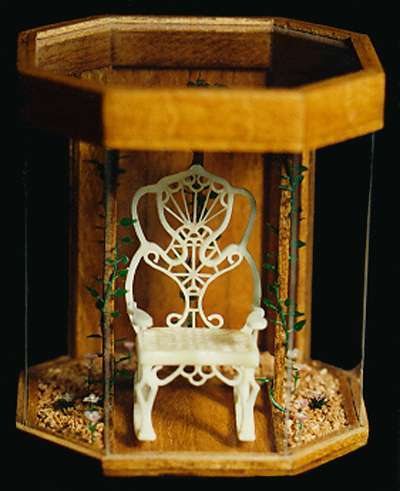 The carved soap chair is wonderful. Such an interesting take (as usual) on the prompt! Actually the purse is in amazing shape - doesn't look like it's ever been used. The clasp is from a different section of the pack so looks much lighter in color. I think it looks kind of like a Dutch tile. Isn't it cute though? I should use it sometime. I'll have to go out and purchase a blue and white outfit. My great aunt did wonders with old newspapers in the nursing home. My cousins son did lots of collages while in prison. Nothing along these craft lines though. I had no idea there was a market for prison art, but your collection shows amazing creativity. I wonder if the red packages were Marlboro which had a horse and crown logo - not exactly like in your picture, but maybe? Wait a minute -- I think the red is Pall Mall. I just went to Postcardy's Sepia entry and she has a picture of Pall Mall. That was my mother's brand, too, so I should have recognized it. Yes, I think you're right. The red is Pall Mall. Now I wonder what the Blue and White one from the purse comes from. My father once had a rooster (in a frame) that was made of cigarette butts -- various filtered and non-filtered butts. It was amazing...but pretty nasty, too. I would have loved to see that rooster made of cigarette butts. That's a new one to me. I hadn't seen the cigarette wrapper art before. I got the impression that this was especially popular in California. I don't recognize the blue and white design. No, I can't figure out the blue and white one either. I'm glad I started my collection when I did. Things were so much cheaper. Love the recycling art I see quite a bit of what I call 'wrapper art' when I visit villages in Cambodia. I adore the commitment to using every bit of available material to create a masterpiece. It's very reminiscent of trench art from the Great War in nature, although it really looks nothing like it. Thanks for sharing your collection. I can't imagine owning one of these myself, but they are intriguing. If you weren't in prison, how would you find the time to produce such things. Another lesson for me from Sepia Saturday. These are wonderful! I had not heard of cigarette packaging used in this way, or maybe I just never noticed. I had forgotten until someone mentioned cigarette butts, that my daughter used them in some pieces she did while in college. She took up smoking in college and art supplies were so expensive, that she often used scrap pieces of wood, broken drawers, all kinds of paper and I guess one day she thought she'd use the butts piling up in her ashtray. These are lovely. The prisoners today wouldn't be making things out of the current cigarette packets. In Australia, the cigarette packets are black with terrible pictures of cigarette related illnesses/patients on them. These are amazing! Completely impressed. Sad that there's no way for the makers to receive the praise they deserve. Impressive finds. True folk art is very hard to find today. Art made by prisoners or by tramps was once an honest way to survive in the first world.